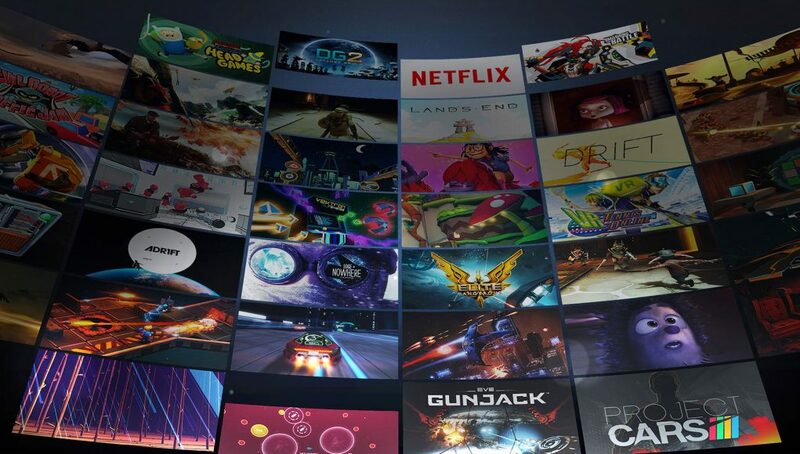 So, you’ve decided to buy an Oculus Rift and Touch and now you want to know what to download first (besides the free stuff). Here’s our breakdown of the best Oculus Rift games that you should definitely play. Before we start, don’t forget that your Rift also works with compatible games purchased through Steam. Thanks to Valve’s open SteamVR platform and OpenVR APIs, Steam supports HTC Vive, Windows VR, OSVR, and Oculus Rift equally, so you can shop around for even more titles that aren’t published on the Oculus Store provided the developer enabled support. And now we present Road to VR‘s best five games for Oculus Touch. One last thing. 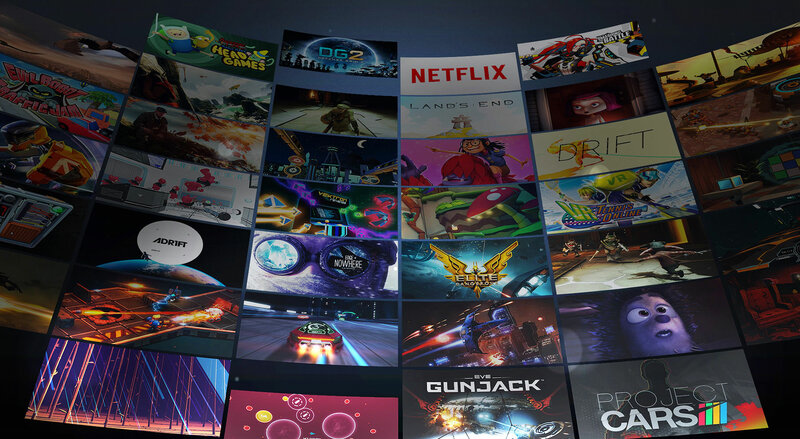 HTC Vive owners can play all of these too with the help of ReVive, a software hack that hooks the Vive into Oculus Store exclusives. Alright, on with the show. People used to think that fast-paced, high-action games would be too disorienting for new virtual reality users, but in Epic Games’ Robo Recall (2017), you can teleport around at full speed as you blast away at the game’s evil (and hilarious) robot army. If being able to tear your enemies literally limb from limb and beat a robot over the head with their own dismembered arm isn’t astounding enough, the level of detail and polish put into this game will make you reassess what’s possible in VR. Find out why we gave Robo Recall [8.5/10] in our review. If you haven’t played the PC or console version of SUPERHOT (2016) before, get ready for a new take on the FPS genre with its strategy-based shooting missions. Designed from the ground-up for VR headsets, SUPERHOT VR (2016) is an entirely separate game in the same vein as its flatscreen counterpart. The iconic red baddies (and their bullets) move only when you do, so you can line up your shot, punch a guy in the face, dodge a bullet, and toss a bottle across the room, shattering their red-glass heads in what feels intensely immersive and satisfying—because you’re doing it all with your own two hands. That and you’ll feel like a badass no matter whose basement you live in. Find out why we gave Superhot VR [9.1/10] in our review. Sharing the top spot are two halves of the same zero-G coin: first-person action-adventure game Lone Echo (2017) and it’s multiplayer counterpart Echo Arena (2017). 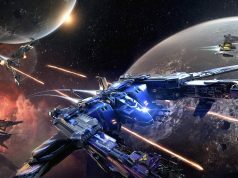 As impressive feats of engineering in their own rights, both games feature an undoubtedly comfortable zero-G locomotion system that lets you fly through the air without the slightest hint of motion sickness. Lone Echo is the sort of cinematic sci-fi narrative that engages the player with its excellent voice acting, impressive visuals, and a deep and memorable story. Combined with its innovative locomotion system, it’s truly a gem of a game worth playing—if only to say you’ve been to the edge of the Universe and back. Check out why we gave Lone Echo a solid [9/10] in our review. Where Lone Echo is plodding and tactful in its storytelling, Echo VR amps up the speed, throwing you in an online team sport that’s a fun mix of soccer and ultimate Frisbee… in space. The best part? It’s free to own permanently. Echo Combat, the first-person shooter expansion to Echo VR, isn’t here yet, but it’s also shown that the high-flying, zero-G locomotion mechanic is definitely suited to other game genres. Edge of Nowhere (2016) Gamepad – A third-person VR survival horror game created by Insomniac Games that strands you in the icy wasteland of Antarctica, Edge of Nowhere leaves you with only a pick-axe, a shotgun, and some rocks to defend yourself against a bloodthirsty ancient species that lurk inside the snowy caverns. Chronos (2016): Gamepad – A third-person adventure by Gunfire Games, Chronos will have you slashing at enemies with the long-trained penchant for beat-em-ups will get you exactly nowhere in this Zelda-inspired, Dark Souls-ish-level of difficulty game where dying in the game physically ages your character. The Elder Scrolls V: Skyrim VR: Touch – While not an Oculus Store game, Bethesda’s Steam version of Skyrim VR fully supports Oculus Rift, letting you engage in multiple tens of hours of exploring the beautifully realized open world environment. What else is there to say? It’s Skyrim in VR. Fantastic Contraption: Touch – In Northway Games’ VR version of their hit puzzle game Fantastic Contraption (2016) you build crazy machines to reach a singular task: get the ball into the goal. Of course, that’s easier said than done as you build wild flailing devices that amble their way to increasingly difficult terrain. Arizona Sunshine: Touch – Offering you a chance to explore, collect real-world guns and indiscriminately shoot them at every moving thing (in this case zombies), Arizona Sunshine fills a very special place in many people’s hearts. The story mode does offer some thrills, but isn’t really groundbreaking as such. Raw Data: Touch – Raw Data is a heavy-hitting, fast-paced game that’s more than just a simple wave shooter. While it presses all the right buttons with atmosphere and feel, the game is on the bleeding edge of virtual interaction, which sometimes doesn’t work as well as it should. Despite its technical flaws, it’s one of the best VR shooters for HTC Vive and Oculus Touch out currently. The Mage’s Tale: Touch – Crafting elemental magic, exploring foreboding dungeons, battling giants and stealing their treasure. There’s all of this and more in The Mage’s Tale. Although story-wise the game comes too close to campy and played out for its own good, it’s still a solid investment for the enterprising young wizard among you. DiRT Rally: Gamepad/steering wheel – Driving through the forest with a beer in your hand isn’t ok…in reality. But in DiRT Rally you’ll need all the soothing ethanol you can get as you stomach the twists and turns of an exciting car simulator, that while rated ‘intense’ on the Oculus Store, is ultimately a fun and exciting way to burn some time perfecting your Initial D drifting skills. Ok. Better leave out the alcohol anyway. If the list doesn’t have the game you’ve been eyeing for months, definitely check out our reviews for some more gaming greats on Oculus Rift, HTC Vive, and PSVR. Update (July 7th, 2018): We’ve done a long-due overhaul of the list, and removed the section containing gamepad-only games. Notable gamepad-only games have been added to honorable mentions. No Elite Dangerous? I can understand it’s a niche taste, but the hours I spent in that game more than triples all the time I’ve spent in all the other short-lived experiences put together, except for Dirt Rally. I find my eyes straining too much looking at what’s mostly a dark background with points of light in them. I think maybe with better resolution HMDs i’ll be able to get into ED a lot more. I agree that a clearer star field makes the game more immersive. I turn the hmd resolution up to 125% just to achieve this effect even though I suffer fps. I have been hesitant to get Elite Dangerous. I can’t shorten it to ED.. (erectile dysfunction…) I have been hesitant because I kno wI could lose myself in a game like that. It took me 8 months of this game sitting in my library before I played it. If you choose to be an explorer, you can take two weeks at a time out of your life. I tried it very briefly, and it was just too complicated for my taste. Bought into VR specifically to play Elite: Dangerous. Been playing that since I got a DK2. That said, this list is Touch and Gamepad games. Elite is best played with a HOTAS. It’s the only vr game I played multiple times after finishing it. What a bounty of games! What a difference a year makes, since CV1 was released. I play edge of nowhere, chronos and wilsons heart on my vive. All great games especially if you don’t want feel like running around the room. Where is Mage’s Tale? What about Space Pirate Trainer!? I guess technically that isn’t out, it is in early release but deserves a mention in a top 5. From what I’ve seen, I don’t think basically a simple alien gallery shooter (Space Pirate Trainer) is in the same league as the other titles on that list. It looks fun and all, but isn’t it really just a pretty standard arcade gun game when all is said and done? Arizona sunshine, Robo recall, Dirt Rally, Mage’s Tale and Elite Dangerous are so far the best actual games on Oculus. Chronos is def #1 for gamepad IMO. Edge Of Nowhere tried to borrow from Tomb Raider and Dead Space yet it still ends up a pretty shallow game as far as gameplay. Story was ok. I was pissed I bought it after beating it. Uh, it made me *very* motion sick, and I have no issue with the other Touch games on the list. In Lone Echo specifically or another VR game? Same here. For me it was the lateral motion when putting out my hands to stop and when pushing off to start. Put me in a cold sweat with nausea. Couldn’t play more than 10 minutes. Guess my brain rebelled against having no real resistance. 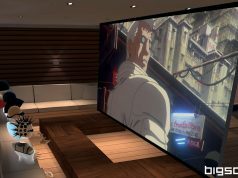 Not Lone Echo / Echo Arena or Robo Recall, but they can all be played via Revive (which is mentioned in the article). I played Blaze Rush and honestly thought it was garbage. It felt like a shallow iOS game built on slightly insidious OCD collection based mechanics or something like that–I think it was just the way it progresses and opens up or something–than a truly satisfying videogame. And the gameplay never ever felt truly satisfying or rewarding. I’m not quite sure what people see it in to be honest. Fast gameplay, a car toy feeling and requires real “oldschool” skill on controllers. That’s what i saw on the game. And about OCD collection based mechanics, you got the wrong impression. You can win all races with the “default” car. If Dead Space, Tomb Raider, and The Last Of Us had a baby, that was a runt and good at nothing it’s parents were, that would be Edge Of Nowhere. Great if you like doing 3 things over and over. 1. running across collapsing platforms, 2. climbing ice walls 3. Sneaking past enemies to advance. Chronos should be #1 IMO of course. 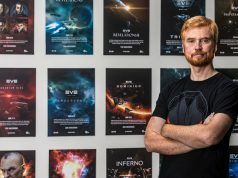 Why Arktica.1 isn’t in the list? Not sure why Rick and Morty would be on here it was just dumb. Robo Recall might have been great if it gave you more locomotion options. Teleporting only still feels like cheating. I’m amazed how few people have heard of In-Death. Easily the best game on Vive right now. Very Dark-Souls-like rogue-like bow game. Nuff said. If these are the first 5 best games for Oculus. Oculus is very bad compared to Steam. This list is specific to the Rift’s default content store (Oculus Home), on which Skyrim VR isn’t available. Of course, Rift users can access it on Steam. My favorite VR game so far is without a doubt InDeath, over 300 hours played. Lone Echo is great as well, there are many great games already. I came across to your website and find you have written amazing content about Android Games. I have one more suggestion for that. Brick Breaker Plus : Most addictive & time killer game. Over 1 Million+ Players enjoying this super cool game. Take a look for this game. Hope you write about this.